Born at 7 months, Gabriel Peh was a pre-mature baby with a very low birth weight of 1.1kg and had to be hospitalized for the first three months of his life. A lung disease saw him being frequently hospitalized till his condition improved. He was also diagnosed with Autism Spectrum Disorder (ASD). Gabriel was subsequently referred to join Club Rainbow (Singapore) (CRS). Prior to his birth, doctors told Jasmine that Gabriel would suffer from a whole host of medical problems. Right after birth, Jasmine only got a fleeting glance of Gabriel who was whisked away for a series of medical checks. Jasmine had to endure the challenge of looking after baby Gabriel almost single-handedly for six months as her husband had been posted overseas for work. To focus on giving her son complete care, which primarily involved bringing Gabriel for numerous medical appointments, Jasmine quit her job. Her consistent efforts paid off when his Chronic Lung Disease showed steady signs of improvement when he turned 3. In her early years, Gessica would encounter frequent meltdowns adding to Jasmine’s pre-existing problems of exorbitant medical bills and providing care for two young children, of whom one had special needs. Nonetheless, she remained resilient and pressed on to seek help for Gabriel. When CRS first started offering speech therapy for beneficiaries, Jasmine applied for speech therapy for him. It took two speech therapy sessions in CRS for the therapist to discover that Gabriel was suffering from Ankyloglossia – a condition which meant Gabriel was literally tongue-tied and required surgery to improve his speech impediment. Jasmine describes her son as an understanding, obedient and well-disciplined boy with a vivid imagination and a flair for the arts. During Kris Kringle, a Christmas event organized by CRS, he received a Lego set, planting in him the seed of love for Lego blocks. Gabriel gushes over his assortment of Lego Police Stations. Currently, Gabriel is a Primary Two Standard pupil at Pathlight. He is able to manage his studies and has been consistent in obtaining good grades. 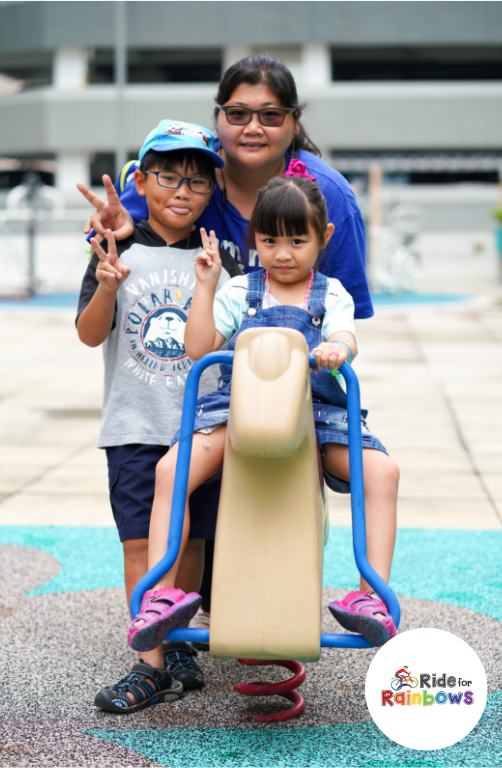 Before they moved to Hougang, the family lived in Bukit Batok and Jasmine knew it was only practical to send Gabriel to school via the school bus. However, both Jasmine and her husband were fearful of Gabriel experiencing a meltdown on the bus. Thus, they made arrangements to reach Pathlight School in a cab just so that they would be able to comfort him in the event of a meltdown. Over time, Jasmine developed the faith that her son would be able to manage his emotions and has entrusted him with the house keys and even given him a mobile phone to contact her. On her decision to do so, she shared, “I have to teach my children survival skills like locking the door and giving them a phone so they can always contact me in case of emergencies.” She then channeled her energy to her daughter, Gessica who at 3 years of age, was diagnosed with high-functioning ASD. This condition coupled with behavioral issues, made looking after Gessica an energy sapping task. On several occasions, she would refuse to listen to Jasmine and choose to go about her own tasks, throwing tantrums and having meltdowns when she felt Jasmine was being too harsh and unreasonable. There were also several instances when Gessica would wander away on her own and get lost in public as well. When Gabriel started having tuition at CRS’ satellite center in KKH, Jasmine met Sally Ong, a KKH senior center executive from CRS. Observing Gessica’s frequent meltdowns whenever she turned up at KKH with Gabriel, Sally suggested that Jasmine seek help for Gessica by enrolling her as a beneficiary of CRS. The silver lining in this entire situation is the endearing relationship that Gabriel and Gessica have as siblings. Jasmine found solace in the fact that her older child could take care of his sister by ensuring her safety at traffic lights, even when she was at her wits end. With the combined effort of Club Rainbow’s Occupational and Speech therapies, Gessica started to develop well and is able to communicate her feelings in a positive manner. She seldom experiences meltdowns, has shown improvement in her behavior. Things are beginning to pick up for Jasmine again. As a mother, Jasmine’s hopes and dreams are like any other. Keen to help other children and youths like Gabriel and Gessica? Click here to donate to Ride for Rainbows 2019, our annual night cycling event that aims to raise funds for children who have chronic illnesses and their families.